To celebrate 30 years of releasing somewhat well-regarded records, CDs and tapes, Sub Pop Records is hosting an entirely FREE event we’ve taken to calling SPF30. 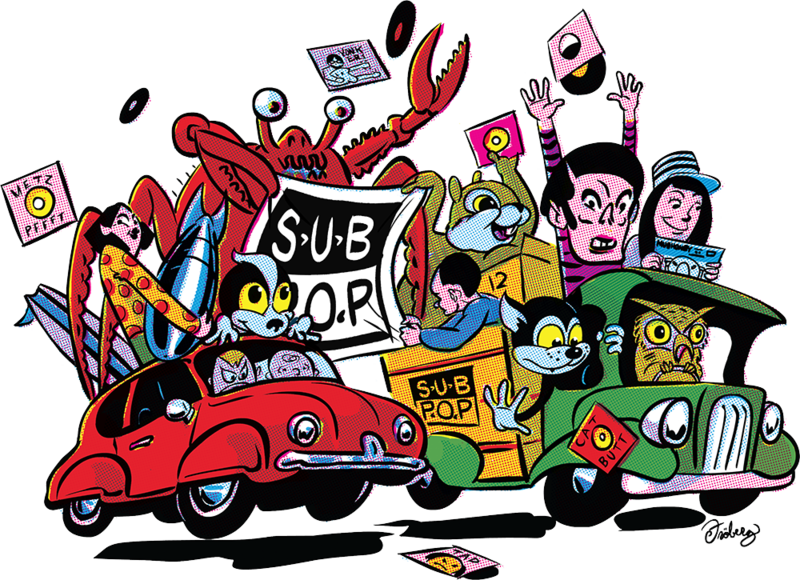 Sub Pop’s 30th Anniversary Party (with entertainment), will be held Saturday, August 11th, 2018 and will have… Bands! 4 stages of live music! A record fair-type event! A host of local nonprofit organizations! A family-friendly area complete with inflatables and live music for, and perhaps by, kids! Food trucks! Beer gardens! (The food and beer and wine and soda or whatever, you will have to pay for! These parts are not free!) Good times and opportunities to embarrass yourself and those who’d always hoped for better for you! Plus, bands! The Moore Theatre •BUY TICKETS! The Mural Amphitheatre • FREE! Alki Beach, West Seattle • Noon - 10pm • FREE! The Crocodile • BUY TICKETS! Throughout SPF30 we will be doing all that we can to help raise money for and get the word out about YouthCare. Though the SPF30 festival at Alki is entirely free, the Night of Comedy From the Cast of Bob’s Burgers at The Moore Theatre on Friday, Aug. 10 is a ticketed event and the proceeds of that event will benefit YouthCare. YouthCare works to end youth homelessness and to ensure that young people are valued for who they are and empowered to achieve their potential. Founded in 1974, YouthCare was one of the first programs to serve runaway and homeless youth on the West Coast. The goal was to help young people find safety today and build a future for tomorrow. Over the past four decades, we’ve defined best practices and developed programs that are a national standard for excellence. Using a youth-centered approach, we ensure that young people experiencing homelessness ages 12-24 have the hope, skills, and confidence to gain long-term stability. Firstly and foremostly, PLEASE limit the number of cars coming in and out of West Seattle, don’t drive unless you really have to, and instead use some form of public transportation to get to SPF30. In addition to the MV Doc Maynard running its regular Saturday service, the Water Taxi plans on running an extra boat (the MV Sally Fox) on the West Seattle route from 11:30 a.m. to 3 p.m. and again from 7:30 p.m. 11:30 p.m. These times are when we expect most people to be traveling to, and returning from, the event. SW Admiral Way and SW Waite St.
Uber and Lyft will be managing the road closures for the festival in app. It will be best to catch a ride to and from the shuttle stops at the Alaska Junction and in the Admiral Neighborhood. From this lot you can either walk approximately 18 minutes/0.9 miles to Don Armeni Boat Ramp to catch a free shuttle, or rent a bike and ride the Alki Trail to the festival. On 63rd Ave SW between Admiral Way and Alki Ave SW.
On Alki Ave SW between 54th Ave SW and 56th Ave SW. Accessible parking hang tags/placards will get you through local access street closures to these parking spots. See you guys at Alki on Saturday! It is our hope that SPF30 (and all of Sub Pop’s 30th Anniversary Weekend) will serve as a super fun and sincere “thank you” to our local and global music community for supporting Sub Pop and our artists for the past 30 years (and the next 30!). In addition to celebrating a dynamic, inspirational roster spanning three decades, we also wish to create a sense of uplifting togetherness where we not only listen to great music but we become better at listening to each other as well. Is there a map of where all of this is taking place, where the stages will be, what streets will be closed for SPF30, etc.? Please see the map above, in the “Getting to SPF30” section. Yes! It is also free! How should I get to SPF30? Detailed transportation info is now posted above! Who is playing when and on which stage? The full schedule is posted above! What food will be available at SPF30? Lots! There are tons of great restaurants already in the Alki neighborhood, and we will have a full list of add’l food options up here soon! What else is happening at SPF30? There will be a record fair, a poster show by Flatstock, beer gardens, Sub Pop merch booths, and great heaps of your fellow music enthusiasts out for a good time. 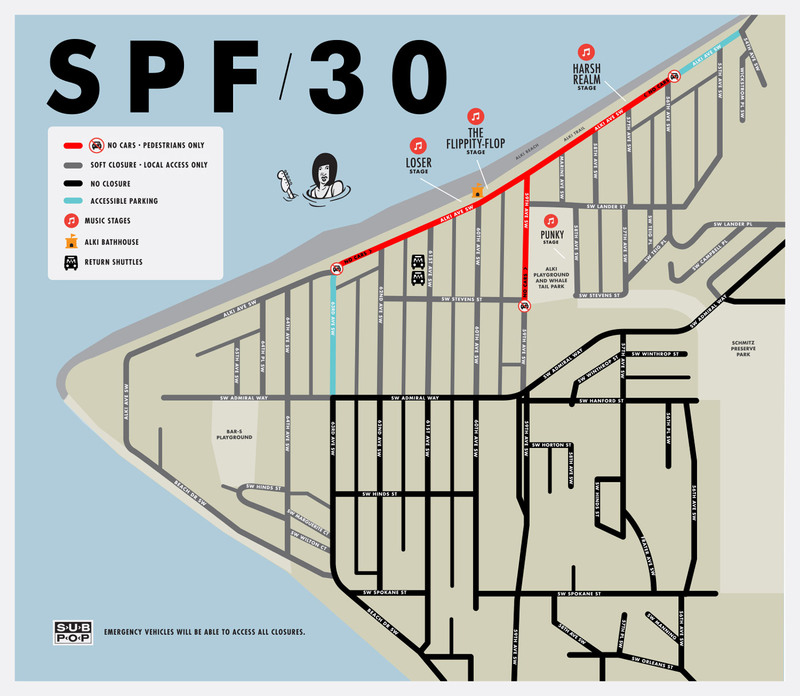 What charitable organizations and non-profits will be at SPF30? A bunch! And we’ll post a list here soon. Are there other events related to Sub Pop’s 30th anniversary? Yes! Many of these are above on this same page and we will have details on more soon. Can I bring my dog to SPF30? Our event is happening in a public space, and so this is ultimately up to you. However, since there will be loud music at SPF30 and large-ish crowds of people, we encourage you to please leave your dogs at home. Can I go swimming at SPF30? We recommend that you do not! Alki Beach is not a swimming beach, the water will be cold and there will be no lifeguards on duty. And as a direct result of all of those factors, we encourage you to please enjoy SPF30 from land. What are you doing to help mitigate the impact of this festival taking place in Alki? This is a zero-waste event which means that are trying to avoid waste and litter as much as possible. If anyone would like to volunteer with us on Monday, August 13th, we will join Puget Soundkeeper in cleaning up the Alki shore and neighborhood. This is a residential area and we will all be guests of Alki residents on August 11th. We want everyone to come down and have fun AND we also ask that people remember that we are all guests for the day. Let's dispose of things properly, using trashcans and recycling bins! Let's use bathrooms and porta-potties when we need to go! And, generally, let’s try to leave the Alki neighborhood better than we found it. Let’s do this right, gang. © 2018 Sub Pop Records, Illustration by Rick Froberg. All rights reserved.